Buttery Soft Butterhorn Rolls - buttery rich, fluffy, horn-shaped rolls that will melt in your mouth. Perfect rolls for all occasions. Easy to make and delicious! Dissolve yeast and 1 tablespoon sugar in warm water. Pour flour into large bowl or mixer. Add scalded milk, butter, sugar, and salt. Give a quick stir. Add yeast mixture and egg. Mix until flour is incorporated. Continue mixing for 30 to 60 seconds. Dough will be very soft and sticky. Let rise until doubled in size (about 30 min to 1 hour depending on the temperature of your home). Punch down, divide dough into two pieces. Roll each half into a circle that's 3/4 to 1 inch thick. Spread butter over top of dough. Cut each circle like a pizza into 12 pieces. Starting with the wider (outside edge of dough, roll each piece toward the center. 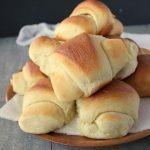 The butterhorn rolls should look similar to a crescent roll. Place on a ungreased cookie sheet with room to spread. Let rise about 15 minutes. Bake at 375 degrees for 20 minutes or until tops and edges are golden brown. while still warm, bast tops with melted butter. You can scald milk in microwave (about 1 minutes). You can mix dough in a large bowl or stand mixer. These look to die for!! Perfect for Thanksgiving! These look so soft and delicious! Yum!